People's Street Summit. Activism at its best. March begins 3pm @ Vancouver Art Gallery and moves to Canada Place. Faeries & Fools Carnival @ Crystal Creek on the Sunshine Coast. The legendary all-night Spring Costume Carnival is back. Three amazing headliners: Gaudhi, Adham Shaikh, Evan Bluetech + Vancity's finest Timothy Wisdom. Begins Saturday, 12pm to Sunday, 6pm. Tix. 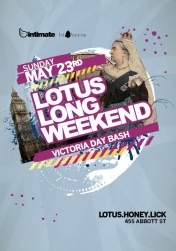 Lotus Long Weekend :: Victoria Day Bash 2010. Intimate brings you the second installment of VanCity's most infamous long weekend event. The quality continues as Bombay Records co-owner DJ Nav is welcomed to the Lotus; Wood 'N Soo in Honey and the Lighta! Sound crew in Lick. You'll won't want to miss this one.